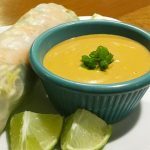 Nutty but tangy, this peanut dipping sauce works as an excellent companion to spring rolls or as a delicious salad dressing. Mix the peanut butter, garlic powder, honey, and Sriracha sauce together. Add rice wine vinegar, soy sauce, and lime juice. Mix again until smooth. Stir in small amounts of water until your sauce reaches the desired thickness.